Like many companies, SABMiller, the world's second largest beer maker, found itself confronting a number of supply chain challenges for its manufacturing and inventory planning operations in its home country of South Africa in the mid-2000s. Much of that was the result of an explosion in the number and variety of SKUs the company needed to produce and manage, as the number of specialty beers and other drinks rose dramatically. SABMiller came to the realization that some of the variables actually had limited impact on the final output. As a result, a number of variables and constraints were eliminated from the models. That in turn led to operational and customer service problems - at the same time where SAB's largely protected home market was starting to see a great increase in outside competition. "We were fighting fires most of the time," according SAB's Rudi van Schoor at the SAPICS conference in South Africa last week. For example, only 54% of production and inventory plans were being met, he said. Plans were regularly developed that were 4-5% above what the plants could really produce. That naturally enough led to stock out and customer service problems. 2008 was something of a crisis year, as all these factors and more led to a huge spike in "out of stock incidents," up some 17% for the year. Not only did that cause customer service issues, but had a direct and significant impact on the company's top and bottom lines from the lost sales. The problem was directly tied to SAB's level of technology enablement for planning and scheduling. Just in South Africa, the company was using a hodge-podge of more than 50 different applications, many of them spreadsheet based or basic database queries that had been developed over time. The planning tools and processes were "transactionally based," meaning use of very simple math, far from true optimization technology. That led to a board-directed call to action along two primary dimensions: (1) immediate analysis and short term action steps that would avoid the huge problems SAB encountered in 2008; (2) search for a new planning system, a challenge in itself because of the unique requirements of the brewing industry. While briefly considering enhancing the systems SABMiller already had in place, building a very custom system using available tool sets, or using the ERP planning modules, the company ultimately selected a "best of breed" APS system from Infor to get the job done. 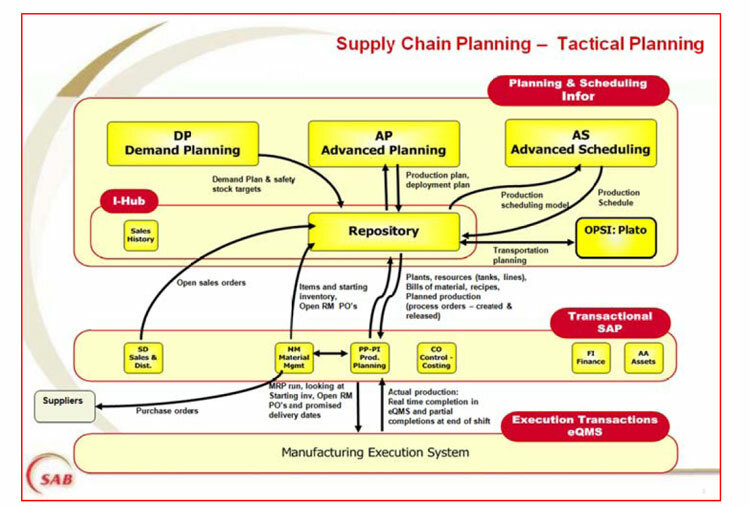 SAB decided to implement three main modules: demand planning, advance scheduling (detailed scheduling) and advanced planning (tactical manufacturing and inventory planning, which would be used as part of the S&OP process). The new tools had tremendous power and flexibility to model SAB's supply chain, according to van Schoor. As the company began its detailed technical design, and the team identified all the variables and constraints involved in planning decisions and processes, the complexity of the model became apparent. There were some 15 million different combinations of the variables and constraints that part of the optimization models (linear programming and some mixed integer programming), from current tank stock levels at each brewery to the availability of CO2 at each location. "Some warning bells started to go off," as the scale of this model complexity was understood," van Schoor said. One issue was simply master data management (MDM). Despite already putting a lot of effort into normalizing and cleaning up its supply chain data before hand, it is impossible to find all the issues until you start to go live, van Schoor said. "Even small data errors can have a big impact on the plan" van Schoor added. As the project proceeded, still more variables were identified, as SAB planners saw the opportunity to make the model better and better once confronted with the initial design. That led to another round of technical design and model building. It also led to increased time needed for testing, as more and more variables and scenarios needed to be considered. The model complexity also meant it took the software longer to complete the optimization run and produce the optimized plan. When a plan was produced that did seem right versus comparison to legacy system outputs, SAB had to spend a lot of time trying to identify whether the cause was an error in the data being used, a mistake in the business rules in the model, or some other issue. Van Schoor said there was also a growing realization that with all the complexity, it was difficult for anyone to understand how changes in the variables really impacted the plan the system would then produce. All this started putting the project well off schedule. Despite being now 18 months into what was supposed to be a 10-month deployment program, van Schoor said they went to the board and told them they needed a restart to get better control of the models and other issues. 1. Was SABMiller really asking the right questions about the optimization models and what was driving perceived problems with the resulting plans? 3. Evaluating the skills required for this transformation, and whether SAB had the right talent in the right places doing the right job. Number 1 included some very basic questions, such as what the outputted plans were really used for, and how they were used, which produced some important insight. There were also questions about what changes to which variables really drove changes in the plan. SAB had originally decided just to build two very large models of its supply chain, one for tactical planning and one for operational planning/execution. As an outcome of this reset, SAB broke up these two large models into smaller models to solve more specific problems, rather than trying to produce an "uber" optimization across too many processes/decisions. More "discrete" planning processes rather than one "galactic" one. That also led to the realization that some of the variables actually had limited impact on the final output. As a result, a number of variables and constraints were eliminated from the models. This also allowed SAB to then be able to "make a clear link between decision variables in the model and the resulting plans" for the first time, van Schoor said. On the other issues, SAB decided for a variety of reasons that master data management for the supply chain planning process would be housed and managed by the supply chain group, rather than relying on the MDM repository in its ERP system. This put responsibility for the accuracy to be with the group that was going to use it. Van Schoor emphasized that different people have different skill sets, and that modelers, for example, may not make good planners or operators, and vice-versa. Now, SABMiller is enjoying the benefits of getting its APS system right. Van Schoor says the company has achieved strong improvements in forecast accuracy and tactical decision-making, and that overall supply chain planning processes have improved dramatically. "We've learned it is better to be mostly right than precisely wrong," van Schoor said. He was joined in his SAPICS presentation by Clint Houston of Deloitte, who worked with SABMiller on this project. Any reaction to this story of SABMiller's APS implementation? Have you learned similar - or different - lessons? What else would you add? Let us know your thoughts at the Feedback button below.